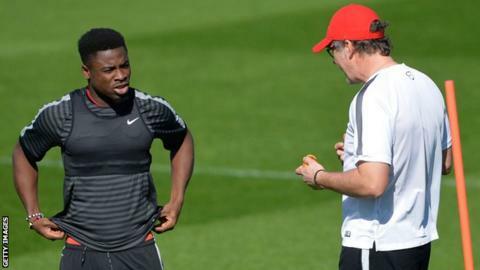 Paris St-Germain right-back Serge Aurier has been suspended indefinitely after appearing to use homophobic language to insult coach Laurent Blanc. The Ivorian, 23, was also shown calling team-mate Angel di Maria a "clown" as he answered questions from fans on social media app Periscope. PSG play Chelsea in the Champions League on Tuesday. Aurier later apologised saying: "What I did was really stupid and inexcusable. I really regret what happened." He told Canal Plus and Bein Sports: "I apologise to the coach and the supporters. I accept all consequences and can only thank Laurent Blanc for all that he has done for me at PSG." In March 2015, Aurier was banned for three European matches after insulting referee Bjorn Kuipers on Facebook. Aurier made comments about Kuipers after he sent off PSG striker Zlatan Ibrahimovic in a Champions League draw against Chelsea.